With the release of three lost classics by the underrated '70s funk quartet now available, Maxayan talks with PopMatters about her music and "the storm" that is life as a black woman in America. Cast your mind back to the great soul/funk/rock pioneers... Parliament/Funkadelic, Sly & The Family Stone, Graham Central Station, Rufus, Labelle. There's a missing name, a name that belongs on the list but which has been overlooked, partly because, until now, it wasn't represented in the digital age: Maxayn. 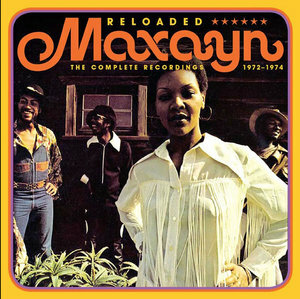 From 1972 to 1974, Maxayn, who took the funk of their forbears and blended it with rock, jazz, soul and a pinch of post-hippie psychedelia, were among the great hopes of the Warners-distributed Capricorn label. To say that they didn't get their props would be to stretch understatement to breaking point. After four decades, Maxayn's music has finally been brought in from the cold by the Cherry Red label. Late last year, it slipped out in a three-disc set, Maxayn Reloaded (simultaneously released to streaming and DL), that didn't get quite the fanfare it deserved, but it certainly ranks as one of 2017's most important reissues. Maxayn took its name from front-woman, singer, songwriter and pianist Maxayn Lewis, a woman whose charisma and talent, to this day, enter the room before she does. If her name sounds familiar, it could be for a number of reasons. Maxayn stands alongside Merry Clayton, Venetta Fields, Clydie King and the Waters siblings as one of the most accomplished backing vocalists in pop/rock history. Her voice has graced albums by Bonnie Raitt, Simple Minds, Duran Duran, Smokey Robinson and Ricky Martin. And that's a tiny fraction of her work. Alternatively, you may know her because she's a former Ikette. At a tender age, she was auditioned and hired on the spot and whisked off on a world tour, having barely ventured from her home state of Oklahoma before. Or you could know her because of her live work; she's toured with Gino Vannelli, Donna Summer, and Rufus. Maxayn also comprised Andre Lewis (Maxayn's husband), a synth wunderkind, plus Marlo Henderson (guitars) and Emry Thomas (drums). Andre and Marlo had, prior to forming Maxayn, been in the Buddy Miles Express. Alone, each of them was a potent, history-making talent. But together, they were explosive. As Maxayn, they issued three albums in quick succession: Maxayn (Capricorn, 1972) Mindful (Capricon, 1973) and Bail Out for Fun! (Capicorn, 1974). Each album was a once-heard, never-forgotten experience, with Mindful the closest to a commercial breakthrough and sometimes the fan-favourite of the three. Maxayn had a formidable reputation as a live act and were at work on a fourth album in 1975, having moved to Manticore Records, when contractual issues and label upheaval brought the project to a halt. Undeterred, Andre signed to Motown and recorded a series of disco-funk albums under the name Mandré, with Maxayn a key participant. Today, Maxayn Lewis maintains a busy schedule, singing sessions, gigging, and working on her compositions, currently focussing on what she terms 'ambient soundscapes'. Part of the magic of Maxayn was, she says, a consequence of the way the group members shared their lives. "We cooked dinner and had breakfast together," she recalls. "It was like a family kind of thing. I thought we were very fortunate to be able to do that. It gave us a lot of being able to understand each other, respecting each other... you learn things and musically it made us very close. We had great communication on stage and our band was famous for being very tight -- the group was viciously in the groove and it was effortless, almost, because we knew each other so well. It was a beautiful thing." Maxayn's music industry ascent happened thanks to a happy coincidence of talent and timing. By the time she left home for university in the late '60s, she was a conservatory-trained pianist, comfortable in front of an audience, but determined to acquire other qualifications. However, when she saw Confederate flags on campus at Oklahoma State University, her feelings about studying there rapidly cooled. What enthusiasm was left was eroded by a racially-motivated assault that could have turned into something even worse. "It was winter and my student apartment was up a hill. I was walking from the library, and this car of white guys pulled up. They were saying, 'You want to party?' And I was saying, 'No! Please just keep going'. They kept driving along beside me just taunting me, and saying nasty things. Then they tried to rustle me into their car. One guy hit me in the face and my nose started to bleed. Across a field was a fraternity house and some guys had stepped out on to the porch to smoke cigarettes. They saw something happening, ran across the field in the snow and rescued me. This guy had really hit me hard in the face, to try to get me into the car. That's what made me think I didn't want to go to that school any more. "I went home for the Christmas holidays and I was totally depressed. I've never been depressed again in my life. I know what depression is. I couldn't wake up, I just wanted to sleep all day. I didn't want to go anywhere. When I told my father, he said, 'Did you report it? ', and I said, 'Well, I could have reported it but it wouldn't have meant anything. Nothing would have happened. It would have just been a joke'. "Maxayn was in the process of considering alternative places to complete her education, when the opportunity arose to sing as part of a nightclub act. Not only did it buoy her spirits, it also ensured that her reputation continued to grow – grow enough, in fact, for word of it to spread to Ike and Tina Turner who invited her to audition when their tour lost an Ikette. She was hired there and then. Her two years with the Turner revue were as thorough an education in the industry as any young person could desire. "The show was like a fine-tuned instrument," Maxayn recalls. "Everything was designed to give an illusion. Our underwear was flesh-coloured, brown, which at that time was very hard to find. It had to be custom-made. If your dress went up on stage, it looked like you didn't have on too many clothes, but you actually had tights underneath. They wanted the skirts to sway together so they were weighted at the bottom. The shoes looked like regular high-heels but they were made so you could really stamp in them. "Everybody's heard all the stories or seen What's Love Got To Do With It (Brian Gibson, 1993) and so on, but when I met them it was before all of that and they were so on top of everything. We were really well paid. Ike would read the contracts to us and tell us what a rider was. He asked 'Do you understand?' He would teach us what each part of the contract meant, so that we were all in it together. He'd say, 'If you get up to the venue, get back stage and these things are not there, you know what's on our rider. This is your show too'. They made us aware as very young people that this was a business. It's fun and it's entertainment, but it's a business, so he taught us how to approach it like that. When it came time to do our taxes, he brought a guy out and we'd have an appointment to go down to the suite and get our taxes done. We'd keep all our receipts and understand that we'd pay our taxes and not try to cheat the government. This was before his fall from grace and he was an excellent businessman." The Turners took the welfare of their young Ikettes seriously, and had met with Maxayn's parents, Emzie and Lorene Parker, to get their blessing, prior to Maxayn joining the tour. "Ike said he would be my father away from my father." By 1971, Maxayn was at the Record Plant in New York with Andre, Marlo and Emry. She had over five years of upper-echelon, music industry experience behind her, including a blues festival tour with Bobby 'Blue' Bland – an opportunity that had arisen after the Ike & Tina tour. She'd declined the chance to be produced by Donny Hathaway so that she could instead accept Andre's invitation to form a band. Their first album, also called Maxayn, was complete and ready for release on Capricorn Records by 1972. Its beautiful gatefold packaging presented the group in fashionable get-up and boasted a stunning, profile-in-silhouette picture of their star on the front cover. The album opened with a rousing battle cry that would forever be associated with the band: 'Trying for Days'. "It was a protest song," recalls Maxayn. "The lyrics have been included in some psychology books at college level. If you really read the lyrics, they apply to the black struggle in America that's been going on since black people were forcibly brought to this country. That's what the lyrics are all about – overcoming. There's always something going on here that's negative and disheartening. You fight one battle and then somebody else comes up with a new way to cheat you out of your rights, to cheat you out of your full citizenship, that kind of thing. So that's what that song is about. "The message never gets old, because the actions that are so negative never stop coming at us, like we live in a storm. If you're black in America you live in a constant storm." Mixing their own originals with two Rolling Stones covers (radically reworked interpretations of 'You Can't Always Get What You What' and 'Gimme Shelter), the Maxayn debut enjoyed a positive critical reception in the States but the group would have to wait 'till the release of their next album for things to start heating up, sales-wise. After some international touring, they regrouped to work on Mindful, with guest turns from Claudia Lennear, Lalomie Washburn and PP Arnold. It was on Mindful that the group achieved the perfect balance, making some commercial concessions without sacrificing their boundary-pushing, experimental sound. Their cover of the Impressions' 'Check Out Your Mind' tore into Billboard's Soul Singles chart and the foursome appeared on Soul Train to promote it. Everything should have been in place to help them consolidate this success with their third album, Bail Out For Fun!, but a combination of bad luck and business issues got in the way. There were notorious distribution problems when it came to Capricorn releases. "Warner did distribution for Capricorn. We would go and play somewhere like Howard Theatre in Washington DC and all these people would ask, 'Why can't we get the records in the store?' Thousands of people were saying this! We took it on ourselves to go to Warner. They had all the albums pressed in boxes and we sent them out to stores ourselves. You wouldn't need to do that today. It was so frustrating. "Just as it looked like Emerson, Lake & Palmer's Manticore label was going to give Maxayn the support they deserved, seismic industry changes finished them off. "The companies were in turmoil. The industry was going through a horrible time. To get anything done, you'd have to go through the same old channels and some of those channels were iffy at best. You'd never know who was in charge. One guy could sign you, then he'd get fired and your project was shelved. A lot of artists got shut down and never recovered, excellent artists to say the least. A lot of really great, truly talented people got a bad deal that way and a lot of them gave up." Maxayn, as fortune would have it, was not one of those who gave up. She threw herself into one project after another, including her husband's albums on Motown and her session work. Her talent took her around the world, including a prolonged period in Japan. Among the artists for whom she's sung backup are Steve Marriott, Sammy Hagar, Rufus, The Gap Band, Rosanne Cash, Rita Coolidge, Tower of Power and Celine Dion. Perhaps one day we'll get to hear the unreleased, untitled fourth Maxayn album that was abandoned when the band's deal with Manticore Records dissolved. But for now, the re-emergence of the three Capricorn albums is grounds for celebration. The missing piece in the jazz-rock-funk puzzle has been restored. Reloaded: The Complete Recordings 1972-1974 is out now on Cherry Red Records.